RockyBelt, the world's first wearable, modular and customizable power bank which is an all-in-one solution for outdoor enthusiasts, has launched on Indiegogo, at https://igg.me/at/rockybelt/, where it is seeking to raise $50,000 to enter its large-scale production stage. The wearable device, which features a compact waterproof 28000mah rechargeable battery and three retractable charging cables—Type-C, Micro-USB, and iPhone—allows any person who enjoys the outdoors or who works outdoors to have a single-charge, efficient, on-the-go charging experience. "There is even a 110/220 AC Outlet add-on that campers, for example, can use to charge any other device or appliance that is not compatible with the retractable charging cables," stated Mehdi Doorandish, the engineer and innovator who developed the RockyBelt. 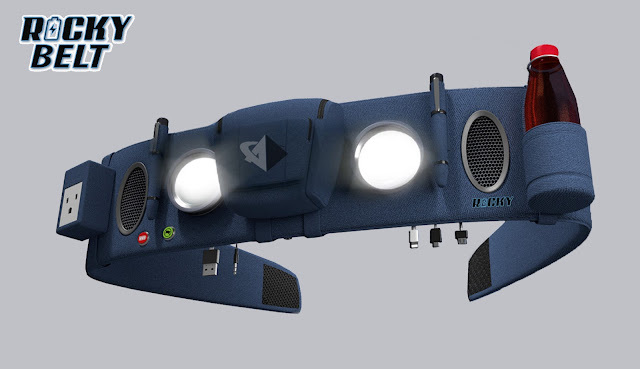 The belt also comes with built-in Bluetooth speakers, hands-free dimmable and adjustable LED flashlights, and even an insect-repellent button that users can activate in order to avoid mosquito bites. Other add-ons include a GPS Tracking Module and a Visible Laser Beam Signal Module, which people can use to be easily found when straying away from groups while exploring the outdoor world. A multi-purpose waterproof pouch is also an add-on that backers on Indiegogo can choose if they want to take their phone or other personal belongings safely and conveniently while avoiding backpacks. "Ultimately, that's my objective. To offer people the opportunity of not having to take heavy, bulky and cumbersome power banks and backpacks when they're outdoors. With RockyBelt, they can listen to music, make phone calls, charge their devices, signal their position, and even play their guitar, anywhere, at any time, and all in a wearable, convenient and hands-free way," Mr. Doorandish explained. This last feature refers to the RockyBelt Pro, a special edition of the RockyBelt that is also available for backers and which has a guitar-friendly design. 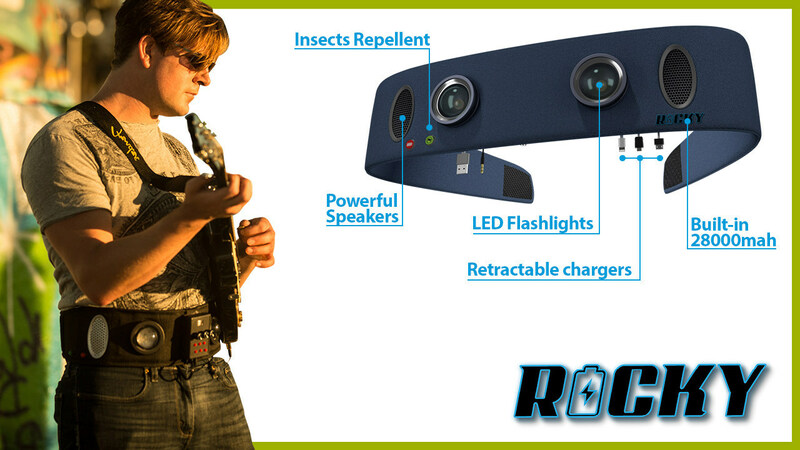 The RockyBelt Pro has an anti-scratch surface to keep guitars unharmed while it also comes with a built-in powerful amplifier, built-in premium AUX/Bluetooth speakers, and with an optional add-on that is a pre-amplifier allowing electric, acoustic and bass guitar players to play their guitar anywhere and stand-alone. "No guitar player will ever again need to take heavy amplifiers and to look for power outlets when going out. With RockyBelt, they can just take their guitar and play it anywhere, easily and with an extraordinary sound quality," Doorandish detailed. Backers of RockyBelt are being offered a crowdfunding discount of up to 50% at https://igg.me/at/rockybelt/. Just launched, the campaign raised 2% of funding in the first hour alone, following a pre-launch that has accumulated 5,000 subscribers who said they were interested in keeping up with the then coming Indiegogo campaign, that is now live.